The Crazy Bookworm: Horror Movie Pick of the Week! With Halloween right around the corner, I thought I would share some of my favourite horror movie picks. You know I love comments so feel free to leave what horror movies scare you! "Newlyweds move into a house where a murder was committed, and experience strange manifestations which drive them away." This is my all time favourite scary movie. I watch it every year on halloween and it still scares me to pieces! The 1979 version the best but I didn't mind the 2005 remake. What I love about this movie is that it has the ability to scare the @&*% out of you without really using any special effects. The story is haunting and it definitely keeps you up at night. The story is claimed to be 'true' just knowing that this may have happened makes it a little more scarier for me. 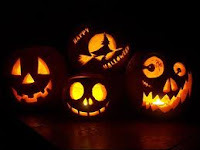 What is your favourite halloween movie? 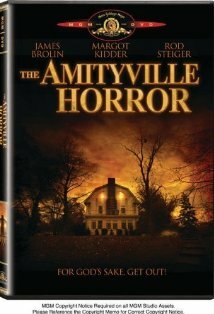 I LOVE Amityville! Scared the crap out of me when I was younger :) But my all time favorite would have to be Halloween. Haven't seen this one yet. Thanks for the recommendation! I go for a scary movie on Hallowe'en night, too :o) My faves would have to be Alien, The Shining, and The Exorcist. I saw the older version of this movie but I haven't seen the newer version. It was a long time ago when I saw the older one and I remember being creeped out. I love your new home page pic! I saw the old Amityville. I hate haunted house movies because especially these days, you're screwed! You can't even sell the house! I've been putting up lots of scary things this month too. I LOVE Halloween!